Médecins Sans Frontières (MSF) focuses on improving access to emergency, paediatric and maternal healthcare in Afghanistan, which has one of the highest maternal mortality rates in the world. After a US military airstrike destroyed its trauma centre in Kunduz, killing 42 people, in October 2015, MSF engaged in negotiations regarding the neutrality of medical care with all parties to the conflict. The conflict in Afghanistan continued to intensify in 2017, exacerbating the already immense medical needs. The number of people seeking healthcare in the six projects MSF runs across five provinces grew steadily. Teams delivered more than 70,000 babies in 2017, almost a quarter of all the births assisted by MSF worldwide. On October 3rd 2015 – one of the darkest days in MSF history – a US airstrike destroyed the MSF trauma centre in the city of Kunduz, killing 42 people, including 14 of our colleagues. This attack on a medical facility left thousands of people without lifesaving care and made an indelible mark on MSF in Afghanistan and around the world. We received an overwhelming outpouring of support from our donors and the public worldwide. At stake was not only MSF’s work in Kunduz, but the ability to provide trauma care on the frontline in conflicts all over the world. Following the attack, MSF engaged in a period of internal reflection and intense discussions at the highest levels with all parties to the conflict. The objective was to understand the limits of providing trauma care on the frontline and reduce the likelihood of any such attacks happening in the future. After a year and a half of negotiations, formal commitments were given that our staff, patients and hospitals would be safe from attack and that MSF could provide medical care to anyone who needed it, regardless of their ethnicity, political beliefs or allegiances. The need for lifesaving trauma care and free, quality medical services remains extremely high in Kunduz. While we know there can never be full guarantees when working in an active conflict zone, we believe the commitments obtained allow us to return and manage the risks that come with providing trauma care in this context. 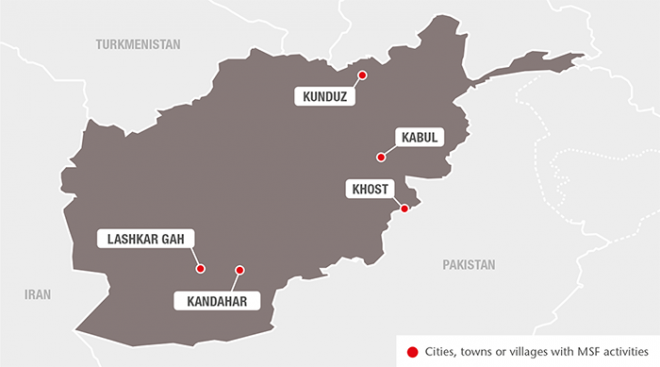 MSF’s return to Kunduz remains a step-by-step process. It started in July 2017 with the opening of an outpatient clinic for stable patients with minor burns, wounds from previous surgical interventions, minor trauma or diseases such as diabetes that cause chronic skin lesions. MSF continues to run a small stabilisation clinic in Chardara district outside the city, and plans to open a new trauma hospital in Kunduz city in 2019. Kabul, the capital of Afghanistan, has experienced massive population growth over the last decade, and the city’s public health services cannot meet the medical needs. People continue to come into the city from other parts of the country, fleeing insecurity or searching for economic opportunities. Since 2009, MSF has supported the Ministry of Public Health at Ahmad Shah Baba district hospital in eastern Kabul, which serves more than 1.2 million people. MSF runs the outpatient and inpatient services, with a focus on maternal health, including ante- and postnatal care, and emergency treatment. MSF also assists with neonatal and paediatric care, surgery, nutrition, family planning, health promotion and vaccinations. MSF staff work in the hospital’s laboratory and X-ray services and run programmes for patients with tuberculosis (TB) and chronic non-communicable diseases such as hypertension and diabetes. The hospital conducted over 116,000 outpatient consultations in 2017 and admitted more than 2,000 patients each month. Over 20,000 babies were delivered at the hospital, almost 60 per day. MSF supports the Ministry of Public Health to provide 24-hour maternal care at Dasht-e-Barchi hospital, the only facility for emergency and complicated deliveries in a neighbourhood of more than one million people. MSF runs the labour and delivery rooms, an operating theatre for caesarean sections and other complicated deliveries, a recovery room, a 30-bed maternity unit and a 20-bed neonatal unit. In 2017, the MSF team assisted almost 16,000 deliveries, a third of which were complicated cases. At the end of the year, MSF started to support another hospital in the area with staff, training and essential drugs in order to increase the facility’s capacity to provide maternity services. Another MSF team works in Boost provincial hospital in Lashkar Gah, the capital of Helmand province. The province is one of the areas most affected by active conflict, and insecurity takes a heavy toll on access to healthcare, particularly on people living in districts outside the city. The hospital – one of only three referral hospitals in southern Afghanistan – has 353 beds and the average occupancy rate is close to 100 per cent. On several occasions during the year, admissions exceeded capacity. In 2017, the team assisted 11,000 deliveries and performed more than 90,000 emergency room consultations. Almost 3,500 children were treated for severe malnutrition, 40 per cent more than in 2016. 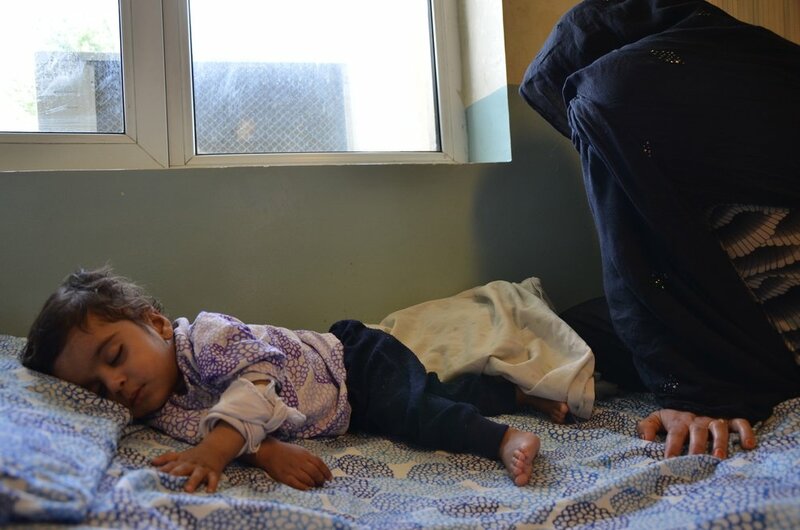 A child rests in the paediatric ward of the Ahmad Sha Baba District Hopsital in Kabul. MSF has been running a dedicated maternity hospital in Khost in eastern Afghanistan since 2012, providing a safe environment for women to deliver around the clock. The number of births continues to grow steadily, with the team assisting almost 23,000 in 2017. MSF also supports five health centres in outlying districts in the province, increasing their capacity to manage normal deliveries so the hospital can focus on patients with complications. As well as strengthening the referral system for complicated cases, this support includes medical supplies, staff training, financial assistance to recruit more midwives, and new buildings for maternity services in two of the facilities. 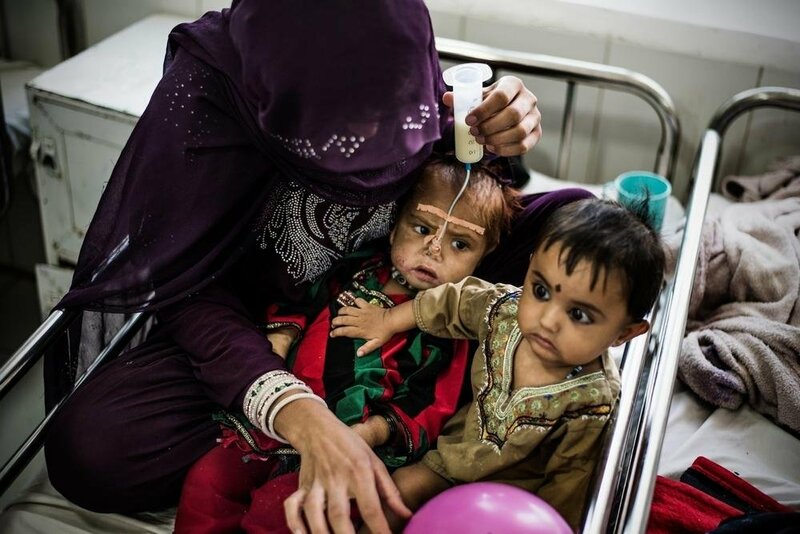 Children receive treatment for anaemia and malnutrition in Boost hospital, Lashkar Gah. In 2017, the first patients on MSF’s DR-TB programme in Kandahar successfully completed their treatment and were discharged. Since the project started, 41 DR-TB patients have been diagnosed and 13 of them have been put on an innovative regimen that reduces the treatment from at least 20 months to only nine. The shorter treatment produces fewer side effects and improves the patients’ quality of life. The project has a laboratory and facilities to accommodate patients during their treatment in Kandahar. MSF also provides support to Mirwais regional hospital, and organises training for other facilities to improve detection of TB, including drug-sensitive cases.